The Sault Metal Scene: LOCAL CONCERT ALERTS (415E), A New Battle Of The Bands, And Much More!! LOCAL CONCERT ALERTS (415E), A New Battle Of The Bands, And Much More!! Here's a new news post for you Sunday afternoon reading, and it includes some assorted recent updates, the latest from a prolific local solo artist, and preliminary details on the first local battle of the bands in far too long. First up though, here's some LOCAL CONCERT ALERTS for next month! Reunited Sault Michigan hard rock quartet 415E will play their second concert weekend since their return on Friday, March 1st & Saturday, March 2nd when they rock The Northern Pines Lounge at the St. Ignace Kewadin Casino! While not yet publically acknowledged on their Facebook page (a vague hint last month aside), the shows were recently confirmed on Kewadin's entertainment page, as part of a mass listing of concerts at the Rapids and Northern Pines Lounges through June. There's not a lot of verifiable hard rock gigs that we didn't already know about, but we'll have a couple more later this week. This will be 415E's first concert weekend in St. Ignace since their final pre-hiatus gigs in July 2017, as well as their first St. Ignace appearances with new bassist Brett Blackwood and drummer Jason VanLuven, so if you missed last month's return weekend, here's your next chance! These 9:00 PM shows have a 21+ age limit and no cover charge. With the stage rust shaken off last month, hopefully 415E have a great weekend at the Northern Pines Lounge next month, and might we finally get some new video footage of 415E with the new lineup in the near future? Visit the above links for more details, and stay tuned for updates as they roll in! The battle proper on March 1st has a 7:00 PM start time and a 19+ age limit, and for more details on attending and registrations, visit the official Facebook event page and/or message Ernest at this link. It's been a long wait since May 2017's NLFB Meltdown event at LopLops for another true battle of the bands in Sault Ontario, so this alone should warrant high interest on March 1st, but who all will enter? Stay tuned in the coming weeks for more information as it rolls in, and see above for more details! Also, here's the latest from local solo hard rock artist Mike McCleary, who posted a lengthy message on his Facebook page on Wednesday to outline his recent work. In the post, Mike noted that he's been working on "heavier, more aggressive" music lately to challenge himself, and while much of his work during his recent musical hiatus related to political activism, that's not a theme in his newest music, specifically his upcoming EP "Propaganda Model", apparent cover art on the right. Mike outlined the lyrical inspiration for his newest songs, including a brand new track named "Y.V.L.M." that he posted onto his Soundcloud page, and the songs have an overarching theme against hate and racism. He was very blunt and direct in his write-up regarding his personal views, so keep that in mind just in case. Mike closed the post by saying that the EP "will be ready tomorrow night" (Thursday the 7th), but at press time, it has not fully posted in sale format that I can tell. I don't know if "Propaganda Model" is indeed completely finished or not (or if it has more than the three publically unveiled songs), but it's great to see Mike back in his usual prolific mode for studio recordings, and I can't complain about a heavier album! 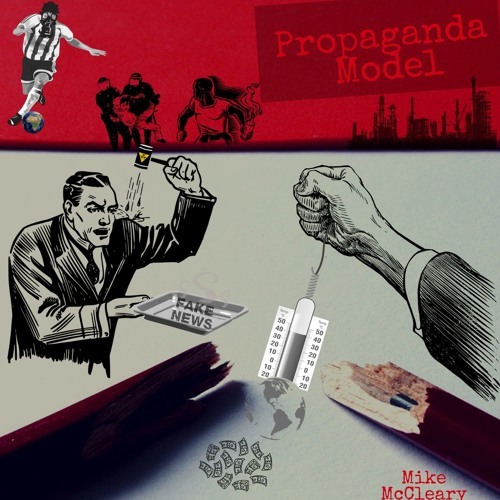 If this does see a paid public release in February, it'll instantly become a favourite for our next CD review on the SMS, but stay tuned at the above links for more on "Propaganda Model"! To help fundraise for this fall's third annual Oh!No concert festival in Leeburn, promoters Six, Two, Oh. will host another 1990s-themed dance party at The Rockstar Bar on March 15th, while also launching an "online fundraiser" a'la Kickstarter or GoFundMe. If you e-transfer donations, you'll get the associated perks for your contribution, ranging from personalized post cards ($5) to early bird tickets ($35) to a lifetime spot on the guest list ($1,000), among other rewards. It'll be interesting to see how well this does, and get more details above on how to make Oh!No III happen! If you wondered why we didn't cover Sault Michigan hard rock quartet Project 906's late-notice show at Huck's Pub & Grill (formerly Joe's Bar & Grill) in Rudyard yesterday, it's because they played at guitarist Joe Jenkins' dad Jeff's retirement party. Even though the band publically acknowledged it, I typically don't cover shows here with an overtly personal nature like this, similarly to why we don't cover bands playing at stags & does. Hopefully their set was a hit, and best of luck to Jeff in retirement! Former Suicide Kings guitarist Steven Flint is looking to jam "more often" with like-minded Sault Ontario musicians, though he is "not looking to play live". While he prefers to play guitar, and is looking primarily for bassists and drummers, Mourning Wood/Soundcheck fans will recall his skill on those instruments. If you're interested in jamming with Steven, message him at this link or via his Musicians Wanted Facebook group post from Friday! That's all for today, but stay tuned for this month's Defunct Local Band Profile next! Thanks everyone!